With its clean lines and striking hardware, the Coraline Completely Frameless Sliding Shower Door creates the ultimate modern showering experience. This door is beautifully designed with premium frosted 3/8 inch tempered safety glass; tested and certified to ANSI Z97.1 Standard and an innovative two-wheeled sliding operation. The Coraline sliding door is available in a number of standard sizes and the top rail can be cut down up to 4 inch for an accurate fit. It is designed for either a left or right-hand installation and is available in multiple finishes. The Coraline door will create an open, minimalist feel in your bathroom and become a focal point. This model does not include the shower base. Images are for representation only. Glass may differ slightly than shown in image due to the nature of light absorption and reflection from your own bathroom's colour, design or decor palette. This is normal and should be expected in certain scenarios due to the glass's natural composition. The Belmore Frameless Hinged Shower Door provides universal sophistication and quality craftsmanship to your bathroom's decor. Available in a vast array of sizes, the Belmore is designed to meet the solution of uneven walls with its inline wall channel providing up to 1 in. out-of-plumb adjustment. The Belmore comes ready to install and will breathe new life into your existing bathroom's interior. Its premium frosted 3/8 in. tempered safety glass; tested and certified to ANSI Z97.1 Standard, hardware constructed of durable stainless steel and leak-seal edge strips makes the Belmore a smart, stylish solution to your existing alcove. A perfect door with a perfect fit, only from Aston. Shower base not available. With its clean lines and striking hardware, the Coraline Completely Frameless Sliding Shower Door creates the ultimate modern showering experience. This door is beautifully designed with premium frosted 3/8 in. tempered safety glass; tested and certified to ANSI Z97.1 Standard and an innovative two-wheeled sliding operation. The Coraline sliding door is available in a number of standard sizes in which the top rail can be cut down up to 4 inches to ensure an accurate fit. It is designed for either a left or right-hand installation and is available in multiple finishes. The Coraline door will create an open, minimalist feel in your bathroom and become a beautiful focal point. This model does not include the shower base. 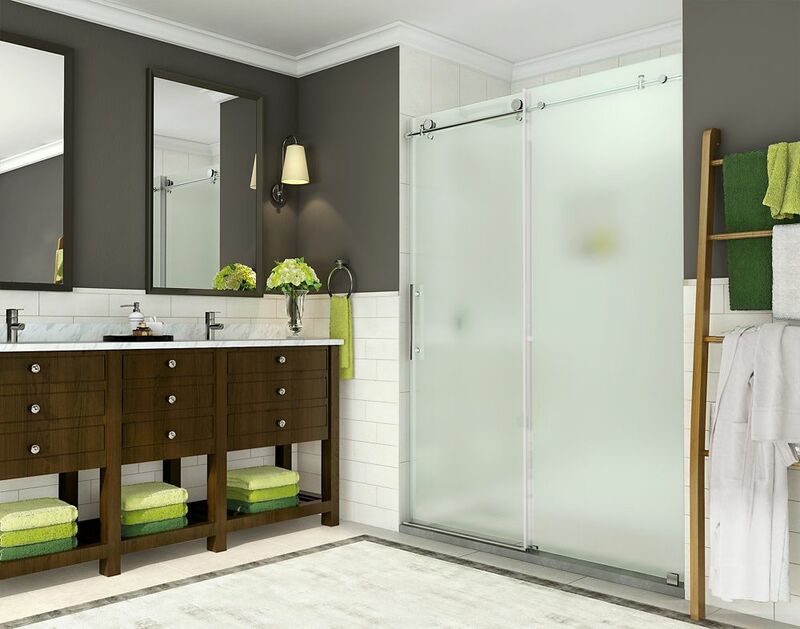 Coraline 44 - 48 inch x 76 inch Frameless Sliding Shower Door with Frosted Glass in Stainless Steel With its clean lines and striking hardware, the Coraline Completely Frameless Sliding Shower Door creates the ultimate modern showering experience. This door is beautifully designed with premium frosted 3/8 inch tempered safety glass; tested and certified to ANSI Z97.1 Standard and an innovative two-wheeled sliding operation. The Coraline sliding door is available in a number of standard sizes and the top rail can be cut down up to 4 inch for an accurate fit. It is designed for either a left or right-hand installation and is available in multiple finishes. The Coraline door will create an open, minimalist feel in your bathroom and become a focal point. This model does not include the shower base. Images are for representation only. Glass may differ slightly than shown in image due to the nature of light absorption and reflection from your own bathroom's colour, design or decor palette. This is normal and should be expected in certain scenarios due to the glass's natural composition. Coraline 44 - 48 inch x 76 inch Frameless Sliding Shower Door with Frosted Glass in Stainless Steel is rated 4.9 out of 5 by 28.